"And we are his witnesses of these things; and so is also the Holy Ghost, whom God hath given to them that obey him." Martin Harris was born on May 18, 1783, at what is now Saratoga, New York. He was the son of Nathan Harris and Rhoda Lapham. When he was ten-years-old his family relocated to Palmyra, New York. On March 27, 1808, when Martin was 25-years-old he married his cousin, Lucy Harris. Lucy was a Quaker from Palmyra and 10-years his junior. Martin and his wife settled in Palmyra and would rear six children. When the War of 1812 began Martin joined the New York Militia, serving during at the Battle of Buffalo as a teamster, and then in the Battle of Puttneyville as a First Sergeant. When Martin returned home after the war he was celebrated as an honored veteran of war in Palmyra. Upon his return, Martin and his wife inherited 150 acres of land. Martin was a hard worker and a shrewd but honest businessman. The couple quickly developed the land into a successful farm, and with Harris' acumen for business and development, he managed to double the size of his farm over the years to 320 acres, making him a respected and wealthy landowner. Martin was a very active participant in Palmyra civic life. His reputation of sincerity, honesty, patriotism and industriousness made Martin a top choice for city positions such as the Vigilance Committee and also Road Overseer. Martin also was an active promoter of the construction of the Erie Canal through Palmyra. Martin was known for his common sense practices, and his distrust of banks, paper money and authoritarian politicians. He was a fan of ancient Greek culture, so much that he wore a Greek-style beard. He was also known for raising money to donate to Greek Christians who were fighting against the Turks. As far as his religious beliefs, Martin had been raised in a Christian home but he considered himself an "unchurched Christian". He investigated various denominations, including the Quakers (of which his wife was a member), Universalists, Restorationists, Baptists, Methodists, and Presbyterians but didn't feel comfortable aligning himself with any of them. He said that in 1818 he felt constrained by the Holy Ghost to not join any churches at that time. To keep up on his burgeoning farm work, Martin would hire local hands that were looking for honest work. Around 1816, he began hiring the sons of the Smith's, a new family to the Palmyra area. The boys were all hard working, and would work on Harris' farm after their work was complete on the family farm they were trying to establish. Martin respected the family's work ethic and the two households became quite close. Sometime in 1824, Martin first learned about the divine encounters his worker, Joseph Smith, had experienced. Martin asked Joseph about it and Joseph told him about his visits with the angel, Moroni, and the golden plates that were hidden in the hill nearby. Both Martin and his wife, Lucy, became enamored with his stories of angels and new scripture, and talked to him about them on numerous occasions over the years. In 1827, when Joseph had finally been allowed by Moroni to retrieve the golden plates from the hill they were buried in, Martin and Lucy both offered to help Joseph. His wife, Lucy, had a vision of the plates in a dream and insisted on giving Joseph $28 ($700 in today's money) to go toward expenses for the translation and publication. Martin helped Joseph hide the plates from mobs attempting to steal the "gold bible". When the situation became too untenable for Joseph to continue with the translation, Martin paid for Joseph and his wife Emma to move to Emma's family home in Harmony, Pennsylvania. In early 1828, Martin Harris went to Harmony to visit Joseph and offered to help with the translation by working as a scribe. Joseph only had an elementary education and was a poor writer and speller. Martin described how the translation of the plates proceeded. He said Joseph would look into either the Urim and Thummim or the seer stone, depending on which he was using at the time, and sentences would appear. Joseph would read the words aloud and Martin would write down what Joseph said. When finished Martin would say, "Written," and if the text was written correctly that sentence would disappear and another appear in its place, but if not written correctly it remained until the error was corrected. Martin, being the pragmatic, no-nonsense man he was tested the veracity of Joseph's claim to have the plates on a couple of occasions. He wanted to reassure himself that he wasn't being duped. In one instance he replaced the seer stone with a duplicate to see if Joseph was faking the translation and just reciting memorized lines, but when Joseph attempted to use the fake stone nothing happened. Wanting more practical assurances, Martin asked Joseph to copy some of the characters from the plates on to a sheet of paper so he could have them authenticated. Martin brought the written characters to three experts, Luther Bradish, Samuel Latham Mitchill, and Charles Anthon, in Utica, New York to examine. He came back from Utica absolutely convinced of their authenticity. He had hoped that having the characters authenticated by a third party would help him gain financial and religious support for the Book of Mormon. Didn't happen, but it was a nice thought. From April 12 to June 14, 1828, Martin Harris was able to help Joseph translate 116 manuscript pages. Much to his sorrow, his wife, Lucy, was backtracking on her support of Joseph Smith. Even though she had received a vision of the golden plates she had become adamant on seeing the physical plates. After being told no she began siding with Joseph's persecutors. She also began pressuring Martin to show her some of the manuscript. Hoping to regain her support and the support of his family, and bowing to her pressure, Martin began asking Joseph if he would take the pages to show Lucy. But each time Joseph prayed about it he was told no. But Lucy wouldn't relent so neither did Martin. Martin was being called back to Palmyra for jury duty and was going to spend 3 weeks with his family. After repeated requests from Lucy and Martin, Joseph finally received permission from The Lord to let Martin take the 116 manuscript pages. The stipulation was Martin had to promise to show the pages only to Lucy, her sister, his brother and his parents. While the pages were in Martin's possession, he broke his promise and showed the pages to some others. Subsequently, they were stolen and never seen again. When Martin didn't return when expected Joseph feared something had happened so Joseph went back to Palmyra to find Martin. That's when Martin told him what happened. The two men were absolutely devastated by the loss, and received a sharp rebuke from The Lord. Joseph lost the gift of translation for a few months and Martin was no longer allowed to scribe for him. He returned home to Palmyra and his wife. However his relationship with Lucy was never the same. Martin was still a firm supporter of Joseph and Lucy was firmly against him. Martin repented of his transgression with the pages and in June 1829 he learned that he was chosen of God to be one of Three Witnesses to be shown the plates by the angel, Moroni. On the designated day, Joseph, Martin, Oliver Cowdery and David Whitmer went to the woods and knelt down and prayed to God to be shown the plates. Nothing happened so they prayed again. But still nothing happened. Martin finally confessed that he felt he was the one keeping them from having their prayer answered, so he withdrew from the group and went to another part of the wood to pray. After he left the three men prayed again and Moroni appeared with the golden plates and turned the pages for the men to see and testified of the veracity of the translation. After the three men completed their visit with Moroni, Joseph went to find Martin. Martin was earnestly praying and invited Joseph to pray with him. After some time Moroni finally appeared to Martin and showed him the plates. Upon seeing the angel and the plates, Martin cried out joyously, "Tis enough; tis enough; mine eyes have beheld; mine eyes have beheld!" Buoyed by being able to witness the physical plates, which probably completely ticked his wife off, Martin agreed to pay the exorbitant publishing fee for the Book of Mormon that was imposed by the printer, which definitely ticked his wife off. Martin had to mortgage his farm to cover the $3000 charged by the publisher. In case you were wondering that's $76,923 in today's money. That left the publisher happy but it also left Lucy livid. Martin and Lucy would officially separate a few months later in June 1830. When Joseph Smith Jr and the church moved to Kirtland, Ohio, Martin Harris went with them. Lucy Harris stayed behind in Palmyra with their children. Martin paid the costs for both households and would travel between Kirtland and Palmyra to spend time with the family. Lucy died a few years later in the summer of 1836. 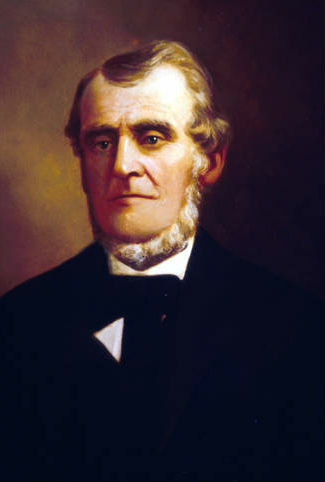 Martin Harris was baptized into The Church of Jesus Christ of Latter-Day Saints by Oliver Cowdery on April 6, 1830, the same day the church was officially founded. Martin served in numerous capacities and had many great experiences in the church. In the summer of 1831, Harris accompanied Joseph Smith to Missouri to purchase property for church members to live. He also helped supervise and finance Church publications. In 1832, Martin and his brother, Emer, served a mission together in Binghamton, New York and baptized one hundred people. In January 1833, Martin Harris was put in jail in Springville, Pennsylvania, to get him to stop preaching. It didn't work, but made for a great story. In 1835, he assisted in selecting the first quorum of twelve apostles. In 1836, Harris attended the dedication of the Kirtland Temple and enjoyed several gifts of the Spirt. After the death of his wife that summer, Martin married Caroline Young, Brigham Young's niece, on November 1, 1836. The couple reared seven children. It was in 1837 that things started going downhill in a hurry for Martin and the church. He had always been opposed to paper money, so when the church started to establish the Kirtland Safety Society and printed paper money he vociferously clashed with Oliver Cowdery and Joseph Smith on the matter. The resulting bank collapse caused him to lose faith in Joseph Smith and his criticisms of Joseph and the church grew to a fever pitch. In December 1837, Martin was excommunicated. When Joseph Smith and the church fled from Ohio to Missouri, Martin stayed behind in Kirtland with is family. During that time he prospered financially and acted as a self-appointed caretaker for the abandoned Kirtland Temple. In 1842 he wrote to Joseph Smith and the church leadership, who were now in Nauvoo, Illinois, to apply for baptism back into the church. It was approved and he was baptized on November 7. He was back in the church but he didn't physically rejoin the church. He still remained with his family in Ohio. After Joseph Smith was martyred in 1844, Martin spent a few years affiliating with splinter groups, including the Strangites, and even had a failed attempt at starting a church with Joseph's younger brother, William. In 1856, Brigham Young, who had lead the church West to the Great Salt Lake Valley, invited Martin and his family to come to Utah and rejoin with the church. That spring, Caroline and the children all made the journey to Utah but Martin still opted to stay behind in Kirtland. He lived with one of his sons, and supported himself by leasing acreages he owned in Kirtland. In 1870, when Martin was 87-years-old, Brigham Young and many other church members offered to pay the expenses for Martin to finally rejoin the body of the church in Utah. He finally accepted was accompanied by train to Utah. He was rebaptized in September to demonstrate his recommitment to the faith. At his rebaptism he publicly testified of the Book of Mormon at Brigham Young's invitation. He was reunited with his family in Smithfield, Utah. Martin Harris died on July 10, 1875, in Clarkston, Utah. "Do I believe it! Do you see the sun shining! Just as surely as the sun is shining on us and gives us light, and the moon and stars give us light by night, just as surely as the breath of life sustains us, so surely do I know that Joseph Smith was a true prophet of God, chosen of God to open the last dispensation of the fullness of times; so surely do I know that the Book of Mormon was divinely translated. I saw the plates; I saw the Angel; I heard the voice of God. I know that the Book of Mormon is true and that Joseph Smith was a true prophet of God, I might as well doubt my own existence as to doubt the divine authenticity of the Book of Mormon or the divine calling of Joseph Smith." "Martin Harris had been unconscious for a number of days. When we first entered the room the old gentleman appeared to be sleeping. He soon woke up and asked for a drink of water. I put my arm under the old gentleman, raised him, and my mother held the glass to his lips. He drank freely, then he looked up at me and recognized me. He said, "I know you. You are my friend." He said, "Yes, I did see the plates on which the Book of Mormon was written; I did see the angel; I did hear the voice of God; and I do know that Joseph Smith is a Prophet of God, holding the keys of the Holy Priesthood." This was the end. Martin Harris, divinely-chosen witness of the work of God, relaxed, gave up my hand. He lay back on his pillow and just as the sun went down behind the Clarkston mountains, the soul of Martin Harris passed on. When Martin Harris, Jr., and his wife returned to the house they found that their father had passed away, but in the passing, Martin Harris, favored of God, repeated an irrefutable testimony of the divine inspiration and the prophetic genius of the great Prophet, Joseph Smith." Martin had been a deep man of faith and integrity his whole life. If Martin had lied about the plates, or been conspiring with Joseph to con and deceive the world, he likely would have wanted to confess and repent prior to dying. Instead, he felt putting his soul right with God included bearing his testimony about what he was been blessed to witness one last time on his deathbed.